The #WalkAway campaign on social media is one of the most powerful movements in the political arena to date under the 45th President of the United States of America, with millions of former Democrats walking away from the Democratic Party in support of President Trump, only to have the mainstream media claim that “Russian Bots” are somehow behind it all. That seems to be the endless narrative from the Democratic Party in 2018, and quite frankly, since first losing the 2016 elections. Democrats are unable to debate facts, because they're either ill-informed as to correct answers, or they're annihilated by the truth provided by Trump supporters and Conservatives in general, so they simply claim that everyone who defeats them is “a Russian Bot,” a tired narrative that's overused and overstated in today's politically charged social media arena. Huffington Post, a notoriously liberal and progressive-ideological haven of bad ideas and poor decisions, ran an article over the weekend which pushed the claim that the “Russian Bots” were behind the new movement to<a href="https://twitter.com/hashtag/walkaway?lang=en"> #WalkAway </a> from the Democratic Party in order to gear up for the 2018 midterm elections. This is hilariously entertaining, only because it's <i>fake news</i>, and it's partially the reason why people are beginning to<a href="https://twitter.com/hashtag/walkaway?lang=en"> #WalkAway </a> from the Democratic Party in the first place. People are fed up with propaganda and lies from the destroy-Trump liberal media. None of these people are bots. None of these people are Russian. First and foremost, I'm not a Russian. I am born proudly as an American, and I've spent my entire life living in the United States of America. I'm in Florida right now, enjoying the end of my Fourth of July celebration week on a Sunday evening, writing a story, contemplating drinking a glass of fine wine, and potentially kicking back on the couch after a long day's work at The Goldwater after attending Church early this morning. If you're reading this, there's a 99.9% chance you're not a Russian either. None of the people above are Russian, nor are they bots. How about you? You're not a “Bot,” and undoubtedly not “Russian,” even if you enough the occasional glass of vodka, right? That was a joke. However, Democrats actually believe this nonsense about “Russian Collusion,” “Russian Meddling,” or “Russian Bots,” and believe they somehow represent the 63 million Americans who voted for President Trump in 2016, and the tens of millions who have flocked towards the “Make America Great Again,” ideals of the Trump Administration, and will support his “Keep America Great” agenda in the 2018 midterms, and in 2020 via his reelection bid. No, I'm serious. They actually believe this. I've read some of the most ignorant posts on Twitter and Facebook from liberals in the last 18 months that I may have ever read in my life, claiming that American citizens are legitimately Russian. I'm sure many of you have seen the same. The allegations are just… Stupidity. It's moronic. It's ignorant. It's everything the Democratic Party represents in 2018, which is lies and deceptions. They have no platform to stand on. President Trump has united the diverse population of the United States of America, from Black to White, to Jewish, to Asian, to Arabic, to Indian, to Hispanic; and give them prosperity. Every person, of every color, creed, and innuendo; has been awakened to the reality of the hypocrisy of the left, the censorship of social media platforms, and the lies of the mainstream media. Unemployment is at the lowest rates in modern American history. Black and Hispanic unemployment are at their lowest rates ever. The American economy is roaring once again. There are jobs available from sea to shining sea across the country. Taxes and regulations are down, and tax cuts from the Trump Administration and the GOP are a huge success. The unnecessary individual mandate penalizing the income taxes of the working class for “Obamacare” is now dead. Our military is being restored. President Trump has put America and Americans first. We're winning again, and Americans know it. What do the Democrats have to campaign on? What can they complain about? All they have is false claims of “Russian Bots,” race-baiting, lies, and personal attacks in general. The Democratic Party is on its deathbed right now. Leaderless and without a platform. Everyone, outside of radical progressives, Communists, and the elite Hollywood drones have already abandoned the sinking ship of the Democratic Party. 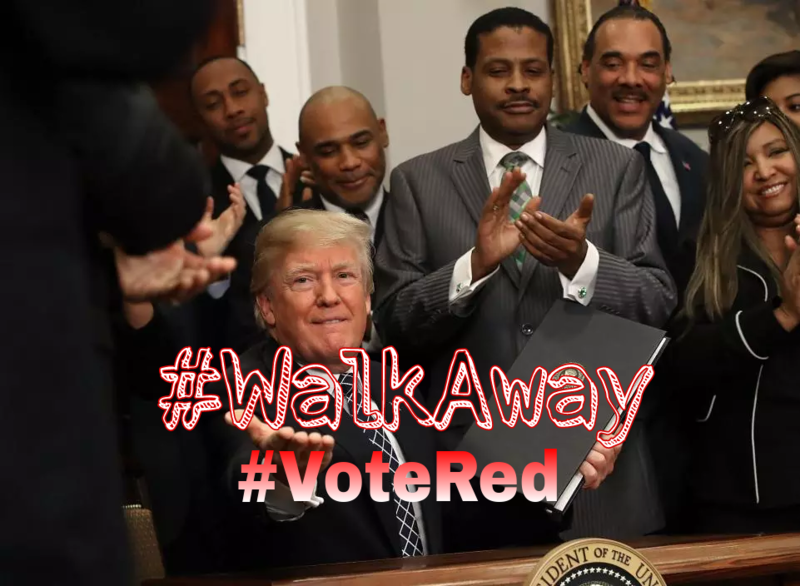 It's time to<a href="https://twitter.com/hashtag/walkaway?lang=en"> #WalkAway</a>.